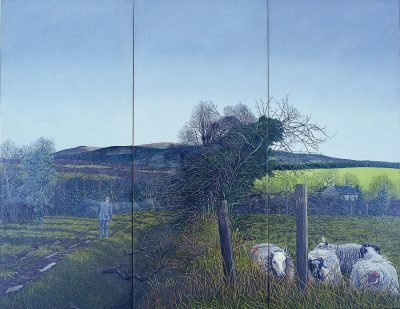 According to art critic Aidan Dunne, Gale’s work is characterised by the ‘mystery of a single moment that contains a bewildering wealth of impressions. The mystery of an action caught out of context and left undefined and ambiguous’. Mystery and intrigue are the hallmark of Martin Gale’s paintings and one can never be impassive in front them. Always, the artist delights in posing as many questions as answers in his pictures, for in them things are never quite what they appear to be. These tense, expectant, hyper-realist images are not idyllic picture postcard Irish scenes. Their surreal quality stems largely from the isolation of his figures in the landscape and the uncertainty surrounding their activities.